Want to slow down your hectic life? 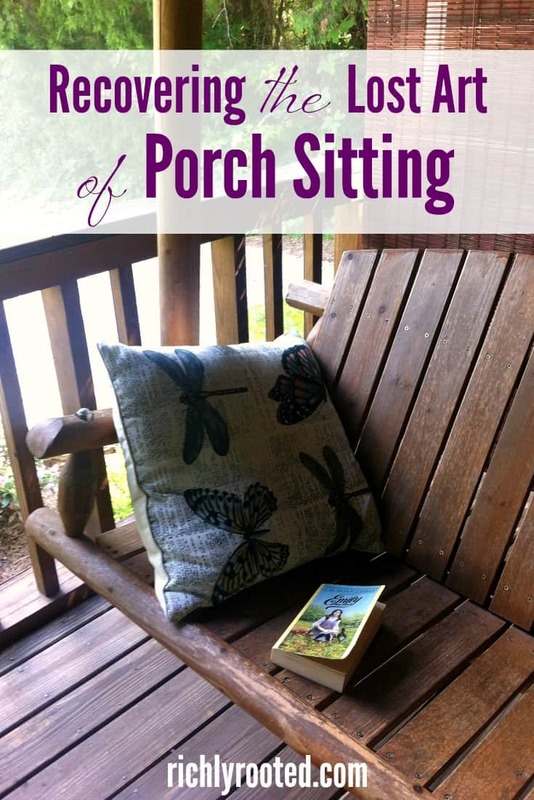 Practice the old-fashioned habit of porch sitting! Here’s how to embrace a more intentional life by enjoying your front porch, + ideas for making your porch pretty and welcoming. I believe we could all be living much simpler, leisurely lives if we simply revived the lost art of sitting on the front porch. People like the idea of porch sitting, but we don’t do it much anymore. Our days are too crowded for us to think of “sitting a spell” and basically taking a time out from the hustle and bustle. When we do have pauses in our day we’re more likely to spend them checking apps and social media. Front porches are an invitation to a slower, more intentional life. 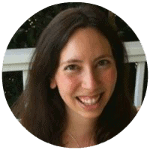 They’re a waiting homescape where we can cultivate the deeper values of connecting with God, our families, neighbours, and nature. Yet for many people, front porches have become merely an accessory for curb appeal–if we have them at all. Although porch sitting isn’t common anymore, this is a recent shift. I haven’t lived many decades, so I can’t pinpoint from my own experience when porch sitting fell out of common practice. But I suspect there’s a lot of factors. Perhaps people spend more time indoors watching TV. Maybe we’ve grown more insular and we prefer the privacy of a back deck. Perhaps we don’t need porches for catching a breeze because we have air conditioning now. Perhaps homeowners would rather spend money on extra bedrooms and closets to store our stuff, so architects have stopped including porches in their plans. Whatever the reasons, it’s a loss. 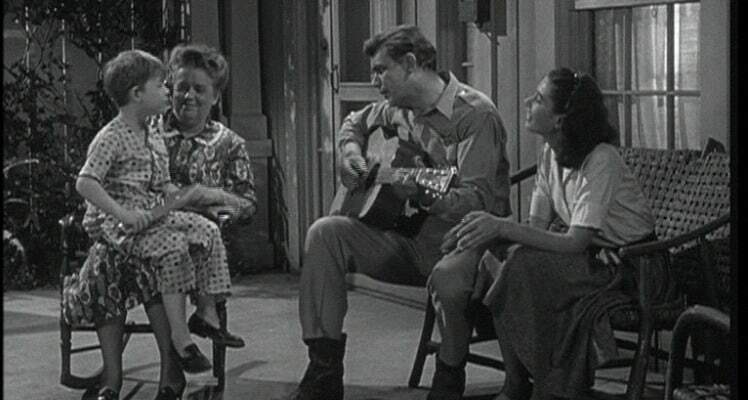 There will always be something utterly charming, homey, and wistful about those books and movies from the last century that portray families doing life on the front porch. From what I’ve read, we have Andrew Jackson Downing to thank for the popularization of the front porch as an iconic feature in American homes. Downing was a landscape architect who lived in the early 1800s. He popularized the front porch in his writings and designs, as a way to link homes and their occupants with nature. Interestingly, Downing believed that the architecture of a home could affect the morals of its residents; it was critical to build homes that were beautiful, functional, and integrated with their natural surroundings. One of my most favourite depictions of an American porch–the porch in Meet Me in St. Louis! Builders today seem to be less idealistic, making homes to suit the shifting priorities and values of their occupants. Drive through an average housing development today and you’ll notice that the most prominent feature is the garage. In more expensive housing developments, the garage may or may not be prominent, but the entryway certainly is. 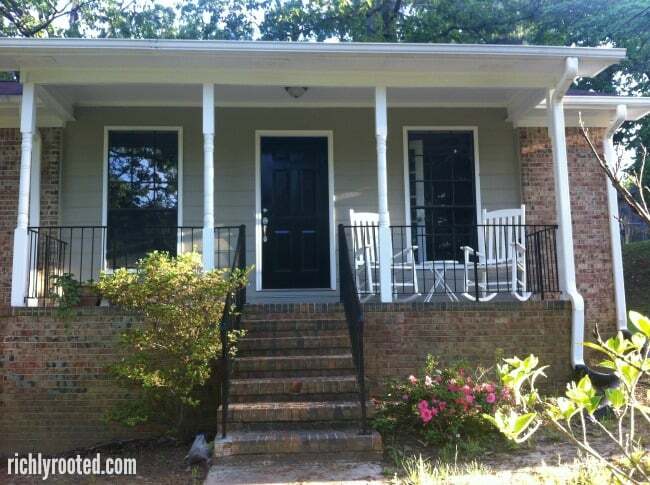 Where I live in the Birmingham, Alabama area, many of the higher-priced new homes feature two-story, vaulted entryways. This architecture style seems built to impress our neighbours rather than foster community with them. Large or small, many of our modern-day homes lack the unassuming graciousness of a front porch. On houses that do have porches, you don’t see people using them much! As I did with the old-fashioned art of dressing up, I’d like to encourage us to see value in this old-fashioned habit and cultivate it. Spend time on your porch at consistent times: for 20 minutes each morning with your coffee, or for an hour or two on a summer evening after the supper dishes are done. If you do this only once in a blue moon, you’ll find yourself saying “we should do this more often!” So do it! Make it a thing. Make it part of the rhythm of your day or seasons. Your day is full of brief activities and moments that could easily be enjoyed outside as well as in. When you give your kids a snack, send them outside to the porch to eat it. Catching up with someone on the phone? Take your conversation outside! Read your book on the porch. Do supper prep like chop soup vegetables or knead bread. Plan for your week with a calendar and notebook. As I mentioned in my spring bucket list, eat a meal (or two) on the porch every day you can. You can start your porch-sitting habit right away without so much as a chair, but it’s also fun to think of ways to spruce up the space so it’s even more inviting. 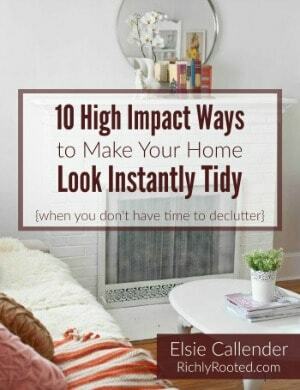 Several items on my list of 30 ways to bring beauty to your home involve porch accessories, and there are many more thoughtful touches you can do as well. When imagining an ideal porch setup, think of the space both horizontally and vertically. For instance, a porch rocker is obvious, but also put things low to the ground, like a colorful rug; or higher up, like a hanging pot for flowers, or a wreath on the door. I’m dreaming of my porch all the way up to the ceiling! Someday, I’d like to paint the ceiling a “haint blue.” It’s a Southern tradition, and it would go prettily with the navy I plan to use on the shutters. Take the porch environs into consideration, too: think what plants you’d like in front or climbing up the side. This is just a sampling of the porch accessories you could add! Think about what you would use and enjoy the most. My very own front porch. I have so many plans for this outdoor “room”! Perhaps you love the idea of porch sitting, and you’d be out there every day…if you only had a porch! Well, let me encourage you to enter into the spirit of porch sitting and get out there anyway. You can put a couple of Adirondack chairs on your front lawn or set up a bench swing. I once heard a speaker at a conference tell about how she put a bright turquoise picnic table in her front yard. Her family would hang out there, and neighbours would drop by for conversation. Now, if the facade of your house allows it, you may be able to build on a front porch in the future. That would be fun because you could design it to your specs! But the point is, you really don’t need a porch to enjoy this old-fashioned practice. Just take the little-used frontspace of your home and start living there. Wave to your neighbours when they pass by, get to know the postal worker, and enjoy the refreshing rest of porch sitting and slow living. Do you have good memories of sitting on the front porch? How are you keeping this old-fashioned habit alive today? Great article! I didn’t realize there were so many front porch sitting appreciators. I wonder the is a “society of front porch sitters” organization? Thanks for tagging my column. Thank you! I really enjoyed your post. It reminded me a lot of the nostalgia of Ray Bradbury’s novel Dandelion Wine. He has a whole chapter just on front porch traditions! Its a southern tradition, I thought, to sit on the front porch. I love relaxing on my front porch with a cold glass of tea or a cup of coffee in the early morn. Love this post. I have a large front porch and we use it every day all summer long. Most days I take a mid-afternoon break with my book and a cup of iced coffee and just relax a bit and breathe! The whole family gathers there in the evening. It’s one of my favorite things about summer! That sounds lovely. Sounds like you are creating wonderful memories with your family! I can’t wait to have my porch just the way I want it, for now, I still sit out everyday to watch the hummingbirds, smell the honeysuckle and chill. I read outside, I take my office work out there. Every morning I write my daily to-do list outside. Once it is covered, it will be even more useful. Thank you, Susan(: A good front porch is a dreamy thing. I love how we can use the space and the atmosphere in our daily and seasonal rituals! I live in the country and love sitting on the front porch in the cool of the morning. I am reminded of younger days when after Sunday dinner we all gathered on the front porch and the stories and laughter my young ears heard. I still smile at the thoughts. That’s so special! Sitting on my front porch connects me to that thread of the past, too. I love it. My house was built in the late 60’s and doesn’t even have a front porch. It has one step up into the house. But in the summer my husband and I like to sit on the step in the early morning with coffee. Perfect! That’s the “front porch mindset”! My neighbors seem to think I’m doing something wrong by sitting on the front porch. Their front window is across but 75 yards away. Well, they are missing out on a piece of the good life! Keep taking a stand for porch sitting! Great arti cle! Yes, I do like porch sitting. We have a deck, not a porch, but we have a large and sturdy umbrella to keep the sun away. I do love sitting outside, but the no see ums usually drive me inside after a bit. They are literally ravenous for my blood and no sprays or candles seem to scare them off. I will just wear long sleeves and pants to compensate. It is one of my favorite places to be. We have no visible neighbors, just woods, miuntains, and a lot of nature. To sit and watch the hummingbirds is a beautiful thing. Sounds like a lovely setup! Sorry about the insects): They flock to my husband and seem to leave me alone…or at least not bother me too much. He is my bug repellent, poor guy. Oh wow, what fun! Thanks for sharing that! I’d love to come some time!